Jenny Chen performing under Domo at the Tippet Rise Art Center, 2016. Design by Ensamble Studio (Anton Garcia-Abril and Debora Mesa). Photograph by Iwan Baan. In architecture, spatial thinking is at the core of the design process. In music, however, space is often considered a surface effect, a veneer of “good” or “bad” acoustics that is applied to sound rather than grounding it. But music is inherently spatial. As it travels from a source to our ears, music is transformed by the air, the surrounding architecture, and the shape of our own bodies. A number of musicians from across time periods, genres, and traditions have acknowledged this gap, and have exploited spatial phenomena to enrich their musical languages. Listening Series: Playing Spaces is presented in parallel with the launch of How Musicians Think About Space, edited by Curt Gambetta and Joseph Bedford, and produced by architectural designer and acoustician Willem Boning for Attention – The Audio Journal for Architecture, which documents musical experiments with the spatial dynamics of architecture and landscape. Through interviews, musical excerpts, and acoustical examples, How Musicians Think About Space illuminates the role of space in the imagination of composers, performers, and producers. This first iteration of Storefront’s Listening Series expands on topics from the journal issue, including the physical phenomena of sound, its reproduction and representation, and the design and occupation of acoustical environments. A performance by sound artist Daniel Neumann will set the stage for a panel discussion with historians, architects, musicians, and acousticians about how musicians engage space as a means for invention. Participants will introduce audio excerpts that capture and communicate a spatial phenomenon, followed by a group discussion on the spatial aspects of musical performance. For Listening Series: Playing Spaces, Daniel Neumann will perform CHANNELS APPLIED #1, an original spatial sound work that responds to the environment of the event, applying the sonic “raw” material of CHANNELS (January 2018), an installation at Fridman Gallery in NYC, to Storefront’s ground floor gallery space and basement. Neumann frequently uses given sonic material as a compositional strategy. In what he calls a “continual concrète practice,” Neumann stages multiple iterations of given material in different sites, systems, and situations, layering, staggering, cutting, and merging sonic traces and imprints. Inspired by the Musique Concrète movement, he proposes that musical composition begins with concrete sounds instead of an abstract idea. But, in contrast to the fixed media compositions of Musique Concrète, Neumann’s pieces do not result in a finished, hermetic work. Rather, each iteration is responsive to its concrete surroundings and different speaker types and systems. The altered sonic material is subsequently re-applied to new listening situations. In this way, Neumann’s performances are temporary concretions that weave different spatio-temporal fragments and layers together. Storefront’s newest event format, the Listening Series, invites close reflection on aural histories, practices, and imaginaries from the real to the virtual. To make the interaction of sound and space legible in new ways, the format examines the ways sound is experienced, how it interacts with the hegemonies of visual media, and the ways in which it mediates perceptions across physical and psychological domains. To transform hearing into listening, the series invites the public to tune their ears to the performance of spaces, voices, instruments, and machines in order to capture, interpret, synthesize, produce, sonify, broadcast, and engage in feedback with information and environments. Willem Boning is an architectural and acoustical designer at Arup. He works at the intersection of architecture, sound simulation and virtual reality and has pioneered new tools for acoustical analysis, optimization and reverse-engineering. Willem led the design of the Tiara, an innovative outdoor music structure at the Tippet Rise Art Center, and has done acoustical design and consulting for clients including Steinway & Sons, the Frick Collection, the American Museum of Natural History, WeWork, Google and the Archdiocese of New York. Willem received his Masters of Architecture degree from Princeton University, and previously worked with Rem Koolhaas at the Office for Metropolitan Architecture in Rotterdam and Hong Kong. Willem has been invited to speak about his work at various institutions and conferences, including RWTH Aachen, Rice University, PUCP Lima and the IoA Auditorium Acoustics Conference, and he writes about music, acoustics and architecture on his blog, www.fromthesoundup.com. Curt Gambetta is a scholar, architectural designer and editor of Attention audio journal, together with Joseph Bedford. He is a fourth year PhD student in the School of Architecture at Princeton University, and holds a Bachelor’s degree from Vassar College and a Master of Architecture from Rice University. Prior to his studies at Princeton, he was the Peter Reyner Banham Fellow at the University at Buffalo School of Architecture and Planning, a teaching fellow at Woodbury University School of Architecture in Los Angeles and a resident of the Sarai program of the Centre for the Study of Developing Societies in Delhi, India. His design and research practice has included a number of public installations, salons and curatorial residencies at Lawndale Art Center in Houston, CEPA Gallery in Buffalo and WUHO Gallery in LA, as well as ongoing research about the architecture and urbanism of waste infrastructure (http://assemblyoftrash.net/). Anne Guthrie is an acoustician, composer, and French horn player living in San Francisco. She studied music composition and English at the University of Iowa and architectural acoustics at Rensselaer Polytechnic Institute, where she completed her Ph.D in 2014. She works as an acoustic consultant at Arup in New York City. Her music combines her knowledge of acoustics and contemporary composition/improvisation. 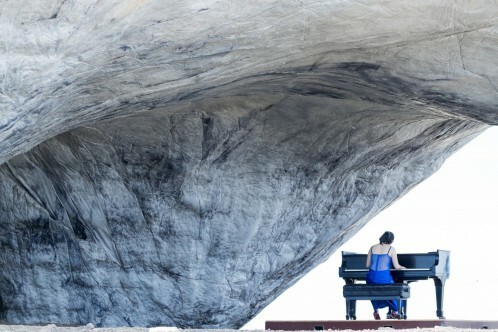 While Guthrie’s electronic music focuses on exploiting the natural acoustic phenomena of unique architectural spaces through minimal processing of field recordings, her composition explores the orchestration of non-musical sounds, speech in particular. Guthrie’s French horn playing focuses on electronic processing and extended techniques used in improvisatory settings, as a soloist and with Fraufraulein and Delicate Sen, among others. Further, her acoustics research centers on the use of ambisonics for stage acoustics. Zev Greenfield is a not-for-profit arts manager, curator and fundraiser with an MBA from Columbia Business School (’05) and over 15 years of progressive global experience across the not-for-profit and arts/entertainment industries. Zev is the Executive Director of the pioneering Brooklyn-based ISSUE Project Room (more information can be found at issueprojectroom.org) and has a long-standing commitment to artists, devising new and inventive programming, plus coordinating critical operating and capital projects, such as the construction of The Orchestra of St.Luke’s DiMenna Center for Classical Music (New York’s first orchestral rehearsal and recording studio). Prior to ISSUE, Zev led the Byrd Hoffman Water Mill Foundation, worked with NY-based orchestras on the development of alternate revenue streams and has served a number of US and international arts organizations. Bobby McElver is a sound designer and composer working with technology, sound, and music in the performing arts. Company member of The Wooster Group 2011-2016. Current associate with Andrew Schneider. Nominated for a 2015 Bessie for Outstanding Sound Design / Original Music. As an expert Ableton Live user, and a Max For Live programmer, he builds new tools and networks to connect sound and visuals for live events. He specializes in interaction between designs, and creates custom systems for theater, dance, and live music. He also freelances as a sound system designer, engineer, consultant, and audio network technician. These technical skills inform and augment his own sound designs for live performance. His creative work includes numerous sound designs and original scores for theater and dance. His designs have been called “Excellent” by the New York Times and “Haunting” by the LA Times. Daniel Neumann is a Brooklyn-based sound artist, organizer and audio engineer. He holds a master’s degree in media art from the Academy of Visual Art Leipzig and studied electronic music composition. Neumann’s practice engages hybrid installation-performance formats to explore how sound interacts with space and how spaces can be shaped by sound. He thinks of sound as an interdisciplinary field enabled by audio procedures. Neumann’s works have been presented at Pinacoteca Bellas Artes Universidad de Caldas, Loop Barcelona, MoMA PS1, Knockdown Center, Pratt Institute, Eyebeam, Sculpture Center and many other venues. As a curator, he runs an event series in NYC and Berlin (CT::SWaM) that engages in spatial sound works and focused listening. As a sound engineer, Neumann is the acoustic designer of The World Is Sound at the Rubin Museum and head engineer for Blank Forms, Alarm Will Sound, Diamanda Galás and David Guetta. In 2013-16, he was the head engineer for live events at MoMA PS1. See Daniel’s website http://danielneumann.org/ for samples of his work. Margaret Anne Schedel is a composer and cellist specializing in the creation and performance of ferociously interactive media whose works have been performed throughout the United States and abroad. As an Associate Professor of Music at Stony Brook University she ran SUNY’s first Coursera Massive Open Online Course (MOOC), an introduction to computational arts. Schedel holds a certificate in Deep Listening and is a joint author of Cambridge Press’s Electronic Music. Her research focuses on gesture in music, the sustainability of technology in art, and sonification/gamification of data. In her spare time she curates exhibitions focusing on the intersection of art, science, new media, and sound and runs www.arts.codes, a site celebrating art with computational underpinnings. Elaine Sisman is the Anne Parsons Bender Professor of Music at Columbia University. Her numerous publications on Haydn, Mozart, and Beethoven include the recent articles “Haydn’s Solar Poetics: The Tageszeiten Symphonies and Enlightenment Knowledge” in the Journal of the American Musicological Society and “Music and the Labyrinth of Melancholy” in the Oxford Handbook of Music and Disability Studies. She received the Ph.D. from Princeton University and has taught at the University of Michigan and Harvard University. A member of the Joseph Haydn-Institut (Cologne) and the Mozart-Akademie (Salzburg), she served a term as president of the American Musicological Society, which elected her to Honorary Membership (2011). In 2014 she was elected a Fellow of the American Academy of Arts and Sciences. Peter Zuspan is a founding principal of the architecture and design studio Bureau V. Bureau V’s recently completed work, National Sawdust, a nonprofit incubator and performance space for new music in Brooklyn, New York, has been described by The New York Times as “the city’s most vital new-music hall,” and has won numerous awards, including Architectural Review’s Culture Award Commended, Architecture Record’s Top 10 Art Centers of the World in 2015, and was nominated for the Mies Crown Hall America’s Prize. In addition to his architectural work, Zuspan is a trained opera singer and musician and has performed in genre-spanning projects in numerous spaces, including Lincoln Center’s Alice Tully Hall, the Venice Biennale of Art, the Musée d’Art Moderne de la Ville de Paris, the Gwangju Biennale, the Guggenheim Museum, and Brazil’s Inhotim. Zuspan currently sits as the Secretary of the Board of Directors of National Sawdust. He has taught architecture at Columbia University, the University of Pennsylvania, and Syracuse University. Attention is an audio journal for architectural culture that uses the medium of sound and spoken word to capture a dimension of architecture otherwise lost in print. By precluding visual media, Attention strikes a distance between the distraction economy of much online media, creating an intimate and reflective space for the in-depth development of ideas and issues. Through interviews, roundtable debates, oral histories, field recordings, the exploration of archival recordings, experimental music and soundscapes, reportage and audio essays, Attention investigates issues of concern to contemporary architectural culture, theory and practice. Attention is edited by Joseph Bedford and Curt Gambetta, with assistance from production consultant Griffin Ofiesh. Attention is a sister project of The Architecture Exchange www.thearchitectureexchange.com, a platform dedicated to fostering debate and exchange in architectural culture that was founded by Joseph Bedford and Jessica Reynolds. Since 2013, the Architecture Exchange has organized numerous public events and peer-to-peer workshops between architects, theorists and historians, as well as a book series with Bloomsbury Press. Attention is available through its website www.attentionjournal.com, iTunes https://itunes.apple.com/us/podcast/attention-audio-journal-for-architecture/id1103549975?mt=2= and other podcast applications such as Stitcher and Mixcloud. Produced by Willem Boning, featuring Jürgen Meyer, Elaine Sisman, Emily Thompson, John Harvith, Susan Edwards Harvith, John Culshaw, Glenn Gould, Paul Théberge, Yasuaki Shimizu, and Daniel Neumann. The introductory audio essay illuminates four aspects of sound in physical space—location, size, reverberation and environmental noise—with examples of how composers from across the spectrum of Western art music exploited these phenomena in their music. Acoustician Jürgen Meyer and musicologist Elaine Sisman show how the classical composer Joseph Haydn used space to create musical effects beyond the boundaries of melody, harmony, rhythm and dynamics. What is music like without the sound of a space? Historian Emily Thompson discusses the aesthetics, technology and politics of spatial absence at the dawn of the recording era while John and Susan Edwards Harvith explain how musicians coped with, adapted to and sometimes thrived in the acoustically dead confines of the recording studio. The pianist Glenn Gould was dogmatic about his recording setup, placing the microphone as close as possible to his piano to exclude the sound of the surrounding room. That is, until he encountered the music of Alexander Scriabin—Gould felt that no one acoustic could do justice to Scriabin’s mystical musical language, and devised a system of ‘sound cameras’ that could zoom into or zoom out of his piano. Gould’s ambitious ‘Acoustic Orchestrations’ experiment remained unfinished, however, until music professor Paul Théberge discovered it in an archive and brought the project to completion. One day, while practicing the prelude to Bach’s Cello Suite #1, Yasuaki Shimizu accidentally ran his tenor saxophone through a reverb machine. The sound so moved him that he embarked on an odyssey to record each of the six Cello Suites in a different acoustical environment. In this piece, Shimizu takes us into a warehouse, a stone quarry, a mine, a concert hall, a Baroque villa and a Gothic palazzo, showing us how the unique acoustics of each site drew out the emotional nuances of each suite in Bach’s masterwork. All Storefront events are free and open to the public. Seating is on a first come, first served basis, with priority seating available for members of Storefront. If you are a member and would like to reserve a seat, contact membership@storefrontnews.org. To become a member, see here. Listening Series: Playing Spaces is supported by Arup.